Welcome to Beatrice Community Hospital and Health Center's pre-registration site! We are happy you have chosen us for your health care needs and look forward to serving you. Completing this pre-registration form will reduce the amount of paperwork you will be asked to fill out during registration when you arrive at the hospital. Pre-registration is a function performed by Patient Registration within our Patient Financial Services Department. Please contact us if you need assistance with completing this form. Between 8 a.m. and 5:00 p.m., you may call us at 402-228-3344. Upon your arrival at Patient Registration, we will obtain all necessary signatures and scan your insurance card(s). We will need to review your insurance card(s) to verify coverage and to determine if pre-certification is required. A photo ID is also needed to verify your identity. Thank you for choosing Beatrice Community Hospital and Health Center! 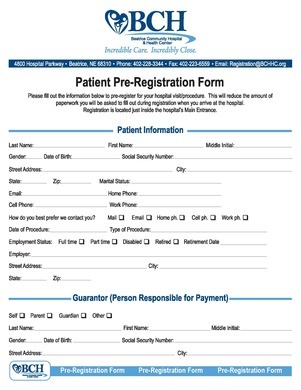 Click here to open and print the Hospital Patient Pre-Registration Form. If you have any questions, or wish to confirm that we have received your pre-registration form, please call 402-229-3344.